Surf Ski Racing is a growing discipline in the US, this style of racing has been popular in South Africa, Australia, and New Zealand for many years. A surf ski is a long, narrow, lightweight kayak with an open (sit-on-top) cockpit, usually with a foot pedal controlled rudder. It is built for speed and just stable enough to handle the rough waters of an ocean crossing. Typically 5-6.5m (16½-21ft) long and only 40-50 cm (16-20") wide, surf skis are extremely fast when paddled on flat water (only an Olympic K1 or K2 kayak is faster) and the fastest paddled craft available over a long distance on ocean swells. Despite its typical instability, a surf ski (with an experienced paddler) is a very effective craft for paddling in big surf. Its narrowness and length helps it cut or punch through large broken waves. 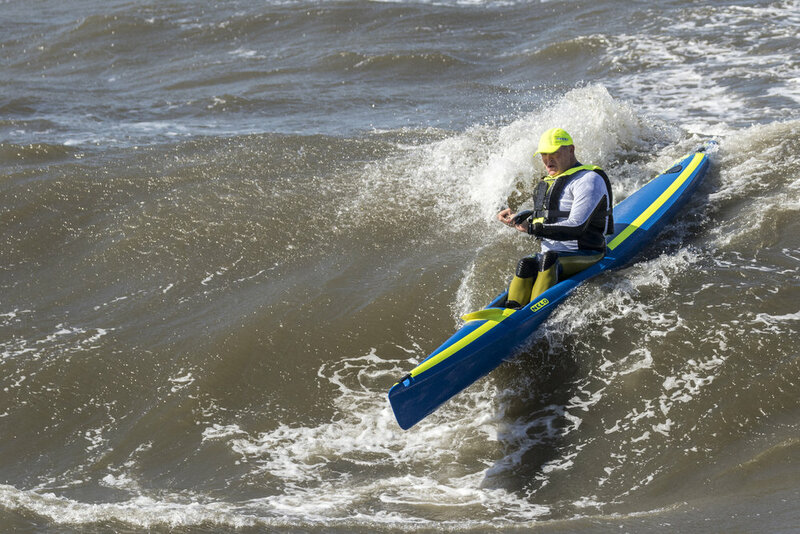 Surf skis are becoming increasingly popular as a versatile racing craft for open class races that take place in sheltered bays, lakes and rivers. One advantage of the surf ski over the traditional kayak is that if the conditions tip the paddler into the water, a "wet entry" is possible by simply climbing back onto the boat and continuing paddling without first having to drain the boat of water. Ocean racing surf skis are usually longer than long distance racing kayaks; they have more longitudinal curvature (rocker); they typically have less transverse primary and secondary stability but more longitudinal stability because the paddler is seated more towards the centre of the craft to enhance wave riding ability. An ocean racing surf ski must have enough volume in the bow to provide buoyancy when punching through surf, a long waterline to make use of ocean swells, a sleek, narrow shape to reduce water resistance, as well as enough stability to make paddling in rough conditions feasible. The Surf Ski is used in competitions all over the world including Australia, Canada, New Zealand, South Africa, the USA and in Europe. It was not long before people began going further afield in these new, extremely seaworthy craft, and ocean racing began to emerge. The earliest races were the Scottburgh to Brighton in South Africa, a 46 km event first held in 1958; the Port Elizabeth to East London in South Africa, a 240 km event held every two years since 1972; and the most famous of them all, the Molokai race in Hawaii, a 60 km event first held in 1976. There are also two major surf ski races held in South Africa and Dubai, the Southern Shamaal and the Dubai Shamaal, the newest surf ski race. There has been a huge growth in ocean surf ski racing in mainland USA.